No, the photo you see is not an artist's rendering. In fact, it was created four years ago in a suburb in the United States. 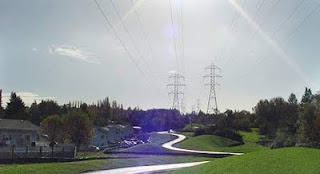 Yesterday I was forwarded the below reference to a suburb in Seattle, Washington that in 2007 opened a Multi-Use Trail running directly in-between two high-power tension lines. This is EXACTLY what could have been on the table in my community of Dunwoody. But was taken off the plans after local citizens all got together with the NIMBY syndrome and came up with all sorts of emotional angst against the wonderful project. Bottom line: It makes me sick to my stomach to read great stories like these in other communities and sense that it’s not a possibility here. Why provide kids a safe route to walk or bike to school? What's so different in the very fabric of our human beings between Seattle and Dunwoody? Why did this get so out of hand and near hysteria set in? You'd figure that the NIMBYs would be more concerned about the unsightly power lines in their vicinity than a bike path that promotes healthy activity, safe routes to school and less automobile traffic. Every time I drive by these stretches of vast open space I think to myself gee wonder why on earth someone hasn't thought to run a multi-use bike trail under those! Now I suppose I know why.